Apprentice Sorcerers needed – no experience necessary! Join forces with Merlin and fellow Sorcerers at Magic Kingdom in an attempt to defeat Hades and other Disney Villains from taking over Magic Kingdom as their own! Sorcerers of the Magic Kingdom is a fun, interactive scavenger hunt, that is free with a park ticket! Head to the Firehouse on Main Street U.S.A. to the left as you enter the park. 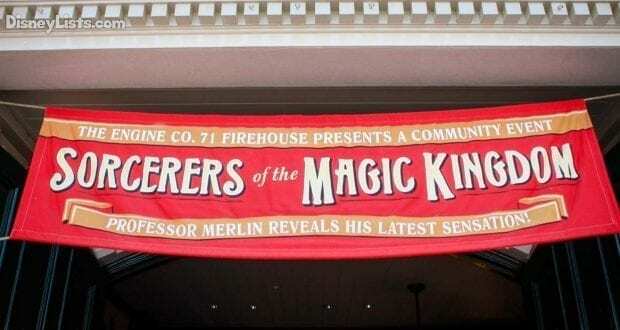 Look up to notice the large “Sorcerers of the Magic Kingdom” banner hanging from the Firehouse. Once inside, you will be instructed by Cast Members how the Sorcerers of the Magic Kingdom works. The Cast Members will instruct you or your apprentice sorcerer on some basic information that will be needed for your quest. First, they will scan your MagicBand (or provide you will a card if you don’t have a MagicBand). This MagicBand is your key to unlocking portals throughout the park. Second, you will be provided with 5 spell cards. These cards have the Sorcerers Crest on the back and an image of a Disney Character on the front. 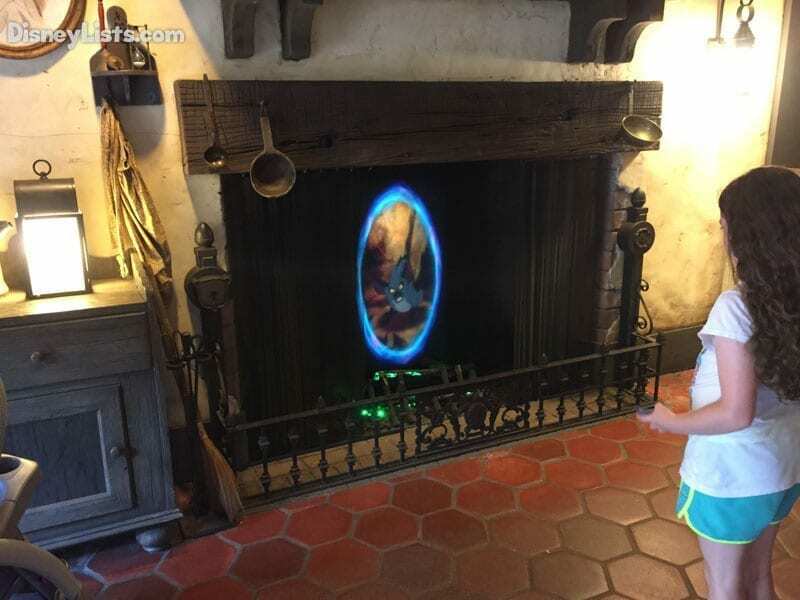 Finally, the Cast Member will take you to a test portal and show you how to use your MagicBand to open the portal and how to use your cards when asked to “Cast A Spell”. Portals are found throughout all areas of the park, except for Tomorrowland. This means your quest will take you through Main Street U.S.A., Fantasyland, Adventureland, Frontierland, and Liberty Square. Portals are typically set up in windows. Just outside of the window is what looks like a lock that you will need to scan your MagicBand on to open the portal. Once your MagicBand is scanned, a video image will begin to appear in the window. This video guides you to take your next step. Keep in mind you must use the same MagicBand you scanned at the Firehouse to open a portal. If you go to the wrong portal, the portal will open but tell you that you are in the wrong place and will tell you where you need to go. TIPS – some portals are tricky to find, be sure to keep your Sorcerers Map handy for an easy guide. If you do lose it, instead of going back to the Firehouse, you could also go to the Sorcerers station located in Liberty Square near Ye Old Christmas Shoppe. Just a note – you’ll notice one portal in particular that seems to have a curtain in the way. When you unlock this portal however, the curtain is pulled back. Merlin comes on the portal screen and is asking desperately for your help to fit against Hades and the evil Villains he has recruited to join his team. They are seeking crystals that are hidden throughout Magic Kingdom that will provide the Villains with the ability to overtake Magic Kingdom. Listen closely to the video (or read the words provided on the screen) and it will guide you on what to do next. Sometimes you are asked to “Cast a Spell” or show the Sorcerers Crest on the back of your card. Hold the card out in front of you and BAM! You’ll knock the featured Villain out! TIP – stand tall when holding your card out in front of you to cast a spell. Our 8-year-old daughter had to hold her card up slightly as we caught on she was holding it too low for the scanners to read her card. The first five spell cards you receive are free from the Firehouse, and really are the only cards you will need to successfully defeat the game. However, cards are highly collectable and you can collect all 70 in total if you’d like! Each time you visit Magic Kingdom, enter the Firehouse and receive another pack of 5 cards. 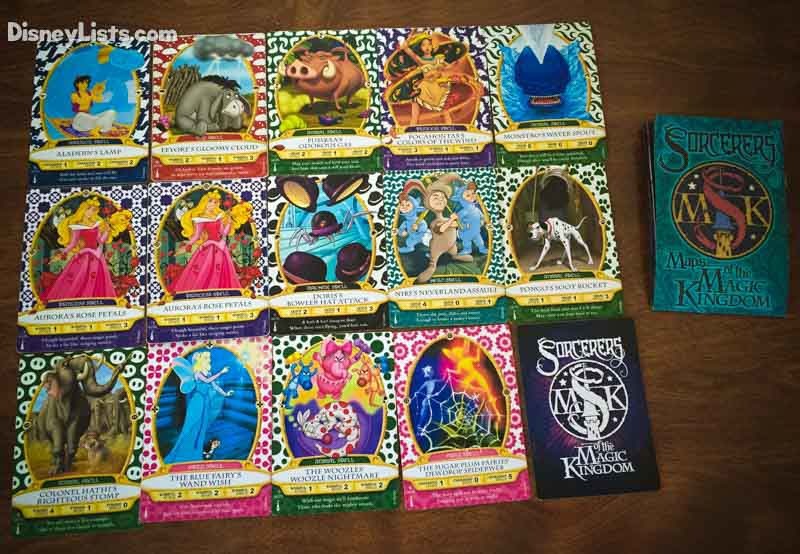 Each card is unique with a Disney character and has noted what spell they provide and what their powers and strengths are (much like a Dungeons and Dragons game card). The Cast Members say the key is to use one card repeatedly as the more you use a card the more strength the card has against Villains. If you are having a hard time defeating a Villain (it gets harder as you go on), you can hold up more than one card to add to your power. According to Cast Members, you can hold up a total of 5 cards to defeat the hard Villains. The portal video sometimes provides key words like 101 Dalmatian references about “spotting” something. If you have one of the Dalmatian spell cards, this would be a good one to use – otherwise use whatever you’d like! TIP – While one spell card might be more powerful than another for a specific round, Cast Members say really any card or combination of cards can be used. It is still fun however to try to combine spells and use what would seem like the most powerful spell against the Villain. Fighting Villains can be a tough feat for Sorcerers! Just when you’ve completed one section of the park, you will be directed to another area, even if you have already been directed to that area previously. There are several rounds of challenges and multiple Villains – but we suspected that as a Sorcerers job is never done! Due to the placement of the portals and the way you will be going from one area to the next, we don’t recommend Sorcerers of the Magic Kingdom for first timer visitor, unless you prefer to spend your time fighting the bad guys instead of waiting in line for attractions. The great news however is that if you want to get started and just do a few rounds, the MagicBand scanned will hold the location of your next portal and all of your previous work for up to 18 months! The scanned MagicBand at the Firehouse is the only one you can use to open the portal. Even if you come back on a different trip with a different MagicBand, bring this MagicBand with you to continue your game. Your MagicBand will hold your progress for up to 18 months. Try your best not to lose your Sorcerers Map – you’ll need it! Use the same spell card as much as possible to build strength – or plan on using more than one spell card (up to 5 spell cards at once) to cast a spell. Also, listen for key words that relate to a Disney character to see if you have a spell card that will work even better for the job. For young apprentices, hold the card up when casting a spell for the scanners to read it, and be prepare to read the video to your young apprentice if needed due to surrounding noise. Have fun Sorcerers defeating those Villains and saving Magic Kingdom!